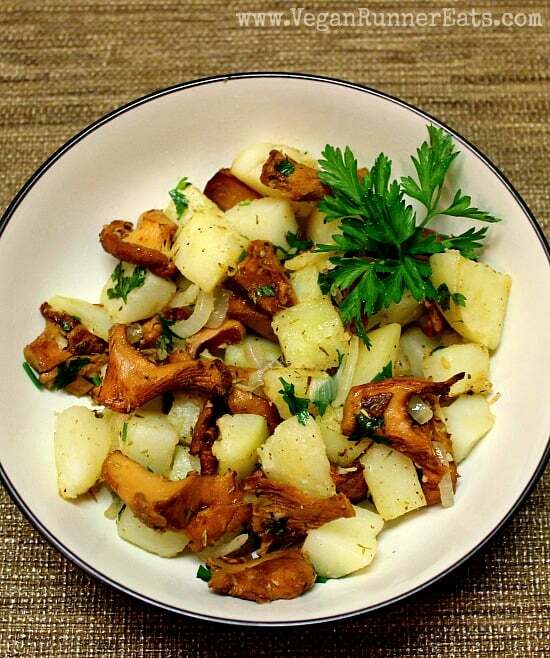 Today I’d like to share with you a recipe that’s been near and dear to me ever since I was a kid growing up in Russia: a delicious and simple stir-fry of chanterelle mushrooms and potatoes. The chanterelle season in central European Russia falls on mid-summer, so this dish was always a treat we used to have a few times every June and July. Since I came to the US eight and a half years ago, I never had a chance to find chanterelles again until Rob and I moved to the Pacific Northwest earlier this year. We found out that this type of mushroom grows pretty well around here, but the season falls on September-October. 2. Since classic Russian food is not known for its abundance of herbs and spices, I took some liberty to add some rosemary, oregano and thyme to my stir-fry to make it more aromatic. Minced garlic also found its way into my pan because garlic makes everything way more flavorful. Ideally, this stir-fry can be cooked in one pan: first, you sautée the coarsely chopped chanterelles, then remove them from the pan onto a plate, cook your potatoes, and add the mushrooms back to the pan at the end. To make things quicker, however, I decided to use 2 pans at the same time, and started cooking the mushrooms and potatoes in separate pans. Once both were cooked, I added the chanterelles to the potatoes, stirred them up, added some chopped parsley, and voila – the dish was ready to be served! Also, back in the day in Russia, I used to make this stir-fry differently by sautéing mushrooms for a few minutes first, then adding potatoes and allowing them to cook right along with mushrooms – this method works too, but I find that potatoes come out a little mushy, making this dish come out more like a stew than a stir-fry. Serving Suggestion: I used this stir-fry as the main course for dinner alongside a fresh salad, but it can just as well be used as a festive side dish at any holiday gathering – Thanksgiving, here we come! Oil or No Oil? The traditional Russian dish is cooked in plenty of oil, but since I try to use as little oil as possible – or none at all – I found that the mushrooms can be cooked completely without oil as they release a lot of liquid, and potatoes can be sprayed with just a bit of olive oil spray to form a nice outer ‘crust’. If you’re not oil-free, you can cook both potatoes and mushrooms in 1-2 Tbsp of oil. And before I proceed to the recipe, I’d like to announce that I’ll be participating in the Virtual Vegan Potluck in a little bit over a month – December 13, 2014 to be exact. In case you weren’t following my blog last year, the Virtual Vegan Potluck is like a big online party where lots of vegan and vegan-friendly blogs link up to form an extensive chain of delicious recipes. If you are a food blogger yourself, you can join the party and bring your own recipe to the table – find out more over here. If you’re not a blogger, you’re more than welcome to stop by my blog (or any of the blogs participating in the potluck, see the list here) on December 13, and check out all of the new recipes in the party! Last year, I submitted my recipe for the Classic Russian Borscht to the potluck, and today I’m sharing another Russian recipe for the potato-chanterelle stir-fry! This simple stir-fry of chanterelle mushrooms and potatoes brings together the flavors of fall, filling your kitchen with delicious aromas of Italian herbs and garlic. Use two pans at once to cut the cooking time in half, or see the directions above on how to make this dish in one pan. Heat 2 nonstick pans over medium heat***. 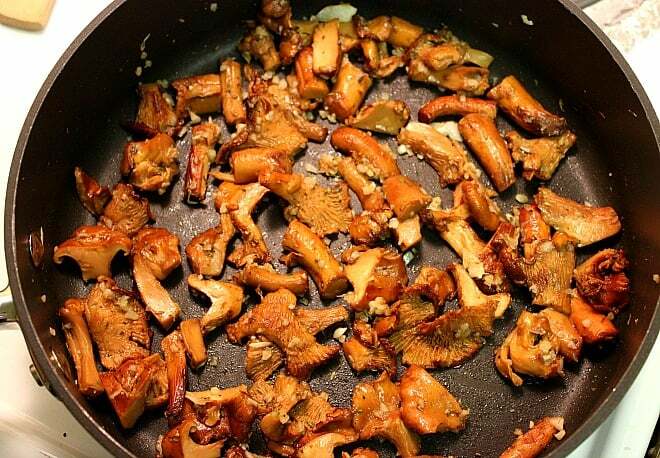 Add roughly chopped chanterelle mushrooms to pan #1 and cover with a lid. Reduce the heat to medium-low, and cook the mushrooms for 5-7 minutes, stirring them a couple times. Once the mushrooms release a lot of liquid, uncover the pan and continue to cook until most of the liquid is evaporated. Sprinkle the mushrooms with a bit of salt, pepper and about a half of all herbs except for fresh parsley. When the spices become aromatic (about 1 min), stir in the garlic, and take the pan off the heat. 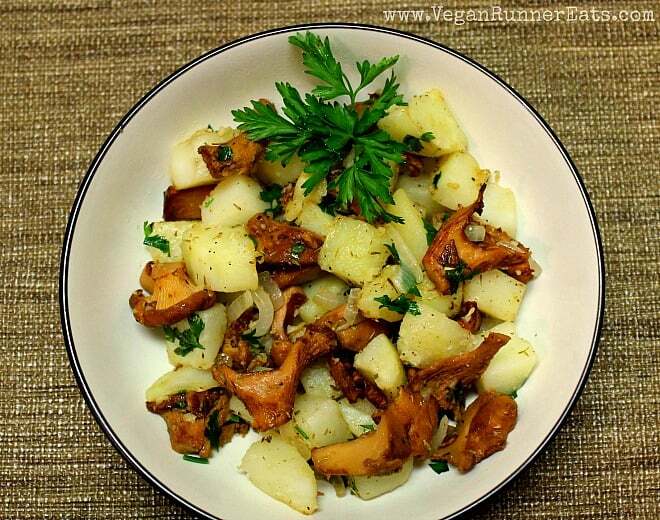 While the mushrooms are cooking, add cubed potatoes to the heated pan #2, and spray them with olive oil cooking spray. Mix them up, and spray them again. (You can omit the oil if using a good nonstick pan.) Cover the pan with a lid, reduce the heat to medium-low, and cook the potatoes for 10-12 min, stirring them every 3-4 min to avoid sticking to the pan. Add sliced onions and cook 2-3 min longer. The potatoes will be done once the cubes can be easily pierced with a fork. If more oil is used, the potato cubes will have a nice crust on the outside. At this point, add the chanterelles along with the rest of the herbs including parsley, mix well. Add more salt and pepper to taste if needed. Serve as a main course with a salad, or as a side dish for any of your plant-based creations! *Although chanterelles may be hard to find in stores if you live in the South, this dish takes on a special taste only when made with this type of mushroom. Alternatively, you can use Portobello/crimini mushrooms and cook them the same way, but the taste will be different (but still good). 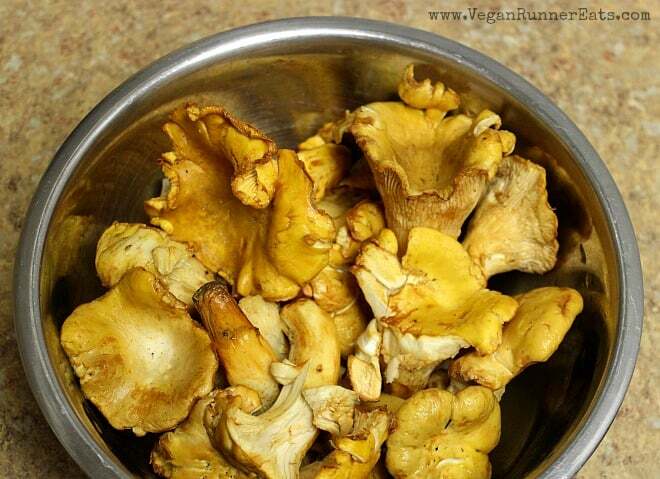 **Chop the chanterelles into large chunks as they tend to shrink quite a bit during cooking. ***You can also make the whole dish in one pan – see directions in the post above. Question for you: What’s your favorite dish with mushrooms? This recipe has been shared at Virtual Vegan Linky Potluck #20 over here. Wow Heidi, thank you for the pointer! Putney woods is such a beautiful place! I like mushrooms like portobellos on my pizza too, but haven’t tried chanterelles – I bet they would be delicious. Chanterelles and porcini mushrooms are my favorites, though I do love all mushrooms. Thank you for this very simple but delicious recipe! You’re very welcome Nadege, please let me know if you make this dish! This sounds like a tasty dish. I will have add it to my holiday menu!